Google Analytics map overlay showing the countries where visitors have been located, keyed in shades of green. Not too many blank spots left! A little late, since this blog is now 14 months old, but I'm pleased to report that it's read all over the world. Woodworking is a universal endeavor with a long history. There's clearly a wide interest in working with hand tools. First post was October 23, 2009; this will be the 56th. I added Google Analytics on February 24, 2010, so all statistics are from Analytics reports starting on that date. I also added a modest level of advertising at that point. The best thing about Analytics for me is the feedback it provides. Going by the number of comments and emails I get, you'd think nobody was reading this. But I can see from the statistics that many people are indeed reading it, and I hope getting as much enjoyment as I get writing it. Now, to the numbers. One of my favorite quotes, mistakenly attributed by Mark Twain to Benjamin Disraeli: "There are three kinds of lies: lies, damned lies, and statistics". These figures are subject to some error and interpretation. There are some counts where the location is shown as "(not set)", so I can't attribute them to any particular country. There's also a counter called "Bounce Rate," which means someone only visited one page before leaving the site. Presumably this is due either to someone doing a search that lands here and it wasn't what they were looking for, or to someone just checking in to see if there are any new posts. Visits for the period Feb 24, 2009 to Dec 15, 2010. 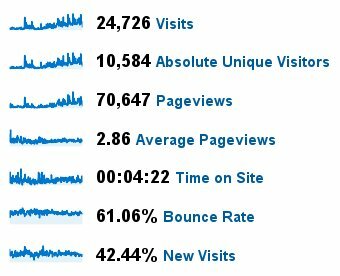 I'm now averaging about 150 visits per day, with a low of 100 and a high of 300, for 150 to 1100 total pageviews per day. The peaks are usually the day after posting, when feeds and aggregators pick it up. Traffic sources. I think "Other" means Twitter. By far, the most common terms of the 4200 searches that resulted in a visit (other than various forms of the blog name) were related to "Roubo" and "workbench". The direct traffic shows that people have the site bookmarked. The referring sites are those that have linked to me (thank you! ), or where I've posted comments or forum entries that allow links. I only got added to the blog roll on the Popular Woodworking Magazine blog in September, and after 3 months it accounts for over 1/6 of all referrals. If you're looking for interesting woodworking sites, many of these are worth checking out. From a content perspective, the top pages visited were again anything "Roubo" and "workbench", followed by "Grimsdale sharpening", "Gramercy Bowsaw", and "Intro Hand Tools". To try to reasonably gauge which countries actually have interested readers, for countries with fewer than 10 visits and 10 pages per visit, I throw out any where the average time on site is less than 30 seconds. This should filter out most of the countries where one or two people randomly stumbled in by accident, though there are a few that just squeak by on the list. All very scientific. 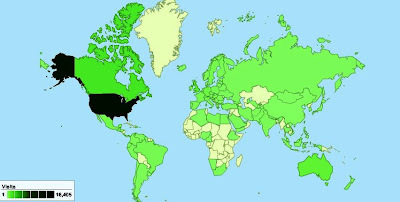 The Map Overlay report lists visits from 107 countries, of which 1 is the "(not set)" country and 28 get thrown out due to the 10/10/30 rule. So I'll call that readers in 78 countries! I can always tell when a new reader shows up, because the stats for some city show one visit with 10 to 20 pages read. Regarding advertising via AdSense and affiliate links, let me just say that readers are as rigorous as I am about ignoring ads! I'm getting my little slice of the Internet Millions, but so far this year it hasn't been enough to take my wife out to dinner. Perhaps next year I'll be able to retire off it. Perhaps not. For those of you who have reached the riveting conclusion here, thanks! And a big thank you to all those who have visited this past year, you make it all worthwhile. Thanks Ben, I've corrected the description of the bounce rate and re-evaluated the list of countries. The 10/10/30 rule still ends up filtering out the same ones by itself, so they were definitely places that didn't have interested readers. But now I know how to interpret the bounces better. We are definitely listening. I think most of us don't have anything useful to add so we keep our mouths shut. Thankfulness to my father who told me concerning this weblog, this web site is genuinely awesome.